For more than a decade, Intuitive Surgical (ISRG) has dominated the robotic surgery market thanks to its groundbreaking and innovative da Vinci Surgical System, a surgical robot that debuted in 2000 and made minimally invasive surgery a reality for patients around the world. The da Vinci System has so many advantages when compared to traditional laparoscopic surgery that it has become the go to for several surgical procedures, such as prostatectomies and hysterectomies. The company's state of the art device has completed more than 1.5 million surgical procedures to date, and nearly 3,000 systems have been sold to date. Intuitive Surgical's stock has acted accordingly, surging to an all time high of nearly $600 back in 2012, reaching a market capitalization of more than $23 billion. Even though Intuitive Surgical handedly revolutionized the robotic surgery market, the company is now entering a phase of declining growth and margins due to pricing pressures from hospitals, and as competition finally begins to enter the relatively new marketplace, more and more emphasis will be placed on pricing and functionality when hospitals are exploring the purchase of a surgical robot. This is where TransEnterix (TRXC) steps in. TransEnterix is a North Carolina-based medical device company that's focused on advanced minimally invasive surgery and is on the cusp of obtaining FDA 510(k) clearance for the Surgibot, a robotic surgical platform that addresses a number of problems and concerns associated with the da Vinci System. Because the Surgibot is expected to receive clearance and begin commercialization in mid 2015, the likelihood of TransEnterix's surgical robot becoming the first viable alternative for hospitals contemplating the purchase of a robotic system is very strong. Here's why TransEnterix represents an under valued medical device company that is gearing up for an extended period of growth and should generate significant returns for patient investors. TransEnterix was founded in 2006 and served as a platform for Dr. Richard Stack of Duke University to develop and commercialize his groundbreaking single incision surgical platform, the SPIDER System. 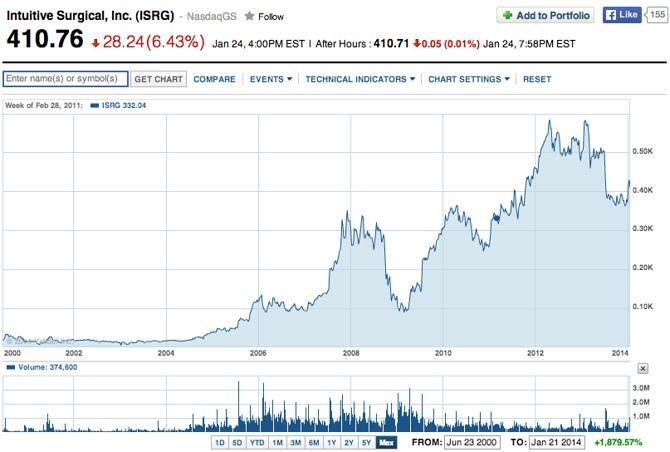 I first highlighted TransEnterix after the formerly private company turned public in September of 2013 through a reverse merger with SafeStitch Medical, a Miami-based company backed by Dr. Phillip Frost. The company has raised nearly $100 million since its inception through several rounds of financing funded by several venture capitalists; this acts as a testament to the level of excitement behind TransEnterix and its technology, given that the overall venture capital market has been sluggish and highly selective over the past few years. The management behind TransEnterix is nothing short of exceptional, and the company has a number of seasoned veterans that are immersed in the developmental process of the Surgibot, as well as the regulatory approval process and legal aspects associated with the soon to be released device. Todd Pope has served as the President and CEO of TransEnterix since 2008, and was previously the President of Cordis, a multi-billion dollar medical device division within Johnson & Johnson. Pope also held several senior level roles at Boston Scientific. Richard M. Mueller joined TransEnterix in 2011 and serves as the CTO and COO of the company. Mueller previously served as NuVasive's (NUVA) vice president of product development for five years where he oversaw the launch of more than 60 medical products (100+ throughout his entire career), which resulted in revenues increasing from $30 million to $500 million. CFO Joseph Slattery joined TransEnterix in 2013 shortly after the merger with Safestitch Medical took place. Slattery previously served as the CFO of Baxano Surgical (BAXS), a company focusing on minimally invasive surgery, and prior to his work at Baxano, Slattery was the CFO and Vice President of Digene Corporation. During his tenure, Digene went public, grew annual revenues growing from $5 million to over $200 million, and expanded internationally. Mohan Nathan has been at TransEnterix for more than three years and is the Vice President of Global Marketing. Prior to TransEnterix, Nathan was a senior marketing manager at Intuitive Surgical, and he's held several brand management positions at Johnson & Johnson. Nathan's direct hands on experience with selling and marketing Intuivie Surgical's da Vinci System is a valuable asset to TransEnterix, along with his perspective. You can view Nathan showcasing TransEnterix's core technology here and here. TransEnterix's management is more than capable of running and growing a multi-billion dollar company from the ground up, and when you include Chairman Paul LaViolette, former COO of Boston Scientific, and board members Dr. Phillip Frost and Dr. Jane Hsiao, it's clear that there is a tremendous amount of value yet to be created for this company and its shareholders. To best appreciate the value proposition of TransEnterix, you need to have a general understanding of the evolution of laparoscopic surgery, and what TransEnterix's SurgiBot has to offer hospitals, surgeons, and patients alike. In the past, open surgery entailed a long incision (up to 12+ inches sometimes) in the abdomen that literally opens up the patient, which allows the surgeon to pry open the rib cage and access what ever needs to be operated on. This traditional approach to surgery results in extensive muscle tearing, significant blood loss, intense scarring, and a long recovery time, which consumes a heavy amount of resources from both the patient and hospital. An advance in surgery came in the late 1980's when laparoscopic abdominal surgery was introduced. In these procedures several smaller incisions are made around the abdomen, and rigid instruments are introduced through these ports to perform the procedure. This advance lowered the blood loss and reduced hospital stay and complications significantly. A major advance in laparoscopic surgery was ushered in with the release of Intuitive Surgical's da Vinci System, a multi-port surgical robot that surgeons control via console situated a few feet away from the patient outside of the surgical field. The da Vinci System utilizes several small incisions that are strategically placed around the area being operated on. The multiple incisions enable internal triangulation, and allow several different tools to be present at the operating site at any given time. The System was also the first to offer 3-D, high definition visualization, a major advance over the 2D systems used in the past. This feature adds a level of depth perception for the surgeon. The initial success of the da Vinci System was based primarily on converting open prostate removal and hysterectomy to laparoscopic approaches. The advantages of multi-port surgery over traditional open surgery include less blood loss, less pain, and a shorter recovery time for patients, which in turn results in less costs for hospitals. With all the positive attributes associated with the da Vinci System, there were bound to be some negatives, and after fourteen years of use, the negatives of the system (high cost, large footprint) are beginning to overshadow the positives. The da Vinci System is expensive, costing hospitals anywhere from $1.5 million to $2.5 million for the system depending on the configuration, not including the required annual service contracts or the replacement of tools and accessories. On top of its high price tag, the da Vinci System is large and bulky; the system cannot be moved from room to room, and it usually takes up an entire operating room, limiting the access of bedside assistants. The moving arms are difficult to reposition, and because the system is run over wires and a computer, the instruments and arms can freeze mid operation. Surgeons have zero tactile feedback when conducting surgery. A loss of tactile feedback means surgeons receive no vibration/resistance/feel to the hands when operating on a patient and therefore can't identify important structures and tissue planes, and can't judge how hard they are grasping on delicate tissue. Surgeons are using two joysticks and have to solely rely on a 3D high definition camera to guide them through the patient. There have been many cases where a surgeon has accidentally snipped a main artery because of this lack of tactile feedback. The loss of tactile feedback lends to a steep learning curve for the da Vinci System, with most surgeons not feeling comfortable until performing procedures on about 12-18 patients. Although the development of training simulation programs has helped speed up this process, some studies comment that the learning curve with robotics is over 100 patients. These drawbacks have created an opportunity for a competitor to step in and offer the next advancement in laparoscopic surgery. TransEnterix aims to do just that with the SurgiBot, a minimally invasive surgical robot that is based on the core technology found in its first groundbreaking device, the SPIDER System. The SurgiBot is a robotic platform that allows surgeons to perform operations, scrubbed in, at the patient's side through a single incision about the size of a quarter (typically the belly button). Once the SurgiBot is inserted through the incision, the device opens up like an umbrella and deploys two articulating and flexible snake like arms that enable internal triangulation, a high definition 3D camera, and another rigid surgical tool at the operating site. The robotic assistance that the surgeon receives from the device allows for precision movement with scaling, increased strength and dexterity, and improved ergonomics. The tiny incision utilized by the SurgiBot should result in less blood loss, less recovery time, and is virtually scarless (hidden in belly button) when compared to multi-port surgery. Because the SurgiBot is a patient side system, the surgeon's hands are directly controlling the instruments inside the patient; therefore 100% tactile feedback is achieved during surgery, something extremely important to all surgeons. The SurgiBot is built around the foundation of traditional laparoscopic surgery, and because the device maintains true tactile feedback, the learning curve for the system should be minimal. It's akin to the introduction of power steering for a car, you already know how to drive the car, now it's a lot easier. The SurgiBot will cost about $500,000, is mobile and can be moved from room to room thanks to its small footprint. The SurgiBot does utilize software that allows scalability to be achieved on a number of different levels. With so many advantages over Intuitive Surgical's offering, it's hard to picture this device being a tough sell to hospitals, surgeons, and patients alike. TransEnterix's SurgiBot is targeting a massive market, and thanks to its affordable price point and small footprint, the company will be targeting another market that has yet to be deeply exploited by surgical robot companies. Approximately 67% of the more than 5,000 hospitals in America do not have a surgical robot. The da Vinci System's high price point has been well received at large hospitals that operate more than 500 beds because they can afford it, but the biggest opportunity for the SurgiBot lies in the thousands of US hospitals that do not have a da Vinci System. 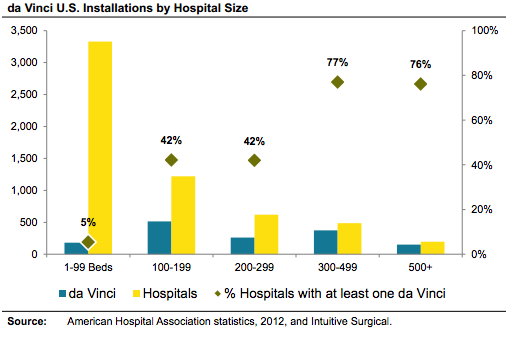 The graph below illustrates a clear picture of the Da Vinci System's US install base, and what remains for the taking for TransEnterix. In addition to hospitals without a surgical robot, hospitals that already have a da Vinci System installed would still be interested in the SurgiBot because of its intraoperative flexibility and mobility. The SurgiBot's market potential in US hospitals alone is staggering, but one market that has yet to be penetrated by surgical robots is the Ambulatory Surgical Centers market. These are outpatient surgery centers that do not require an over night stay. More than 5,000 of these centers exist in the US, and they may soon outnumber hospitals. The da Vinci System's high price point and large footprint has limited its ability to market to these small surgical practices, which is why the SurgiBot stands to gain a lot of traction as soon as it's deployed. This point attests to CEO Todd Pope's view that the SurgiBot is not directly competing with the da Vinci System, but rather expanding the overall market. The SurgiBot will be targeting weight loss surgery, Cholecystectomies, and other types of surgeries that total more than 2 million annual laparoscopic procedures in the US alone. The market potential for TransEnterix balloons even higher when you consider the thousands of hospitals located internationally. The company expects to receive European clearance (CE mark) around the same time it receives FDA clearance. Since I first published a piece on TransEnterix in November of 2013, my bullish investment thesis has received a number of questions from many people invested in other surgical robot companies. Here are some answers to the most common questions I have received. Are any prominent surgeons using TransEnterix's technology? TransEnterix already has a base of US surgeons that are using the SPIDER System for minimally invasive procedures, and providing feedback for the SurgiBot. More than 3,000 surgeries have been completed with the SPIDER System since it launched in 2010, and there's no doubt that the company's current install base is eagerly awaiting the release of the SurgiBot. Some prominent surgeons that have been utilizing the SPIDER System include Dr. Michel Gagner, and Dr. Sherman Yu. Dr. Gagner is considered one of the world's foremost experts in minimally invasive surgery, having authored more than 225 published journal articles and 5 books on the subject. Dr. Gagner has been participating in pre-clinical trials for the SurgiBot, and currently he serves as the President of the 2014 World Congress of the International Federation for the Surgery of Obesity and Metabolic Disorders. Dr. Gagner was co-surgeon for the world's first trans-Atlantic surgery. Dr. Yu has completed more than 100 surgical procedures using the SPIDER System, with 100% of his patients saying they were satisfied or extremely satisfied with their overall experience. Dr. Yu has been recognized as a Centers of Excellence Surgeon, and the Consumers Research Council of America has named him one of America's Top Surgeons. You can watch Dr. Yu demonstrate the SPIDER System here. TransEnterix's technology has been featured on a number of news outlets and medical shows, and Dr. Oz has even promoted the SPIDER System as being a revolutionary device in scarless surgery. If TransEnterix's technology is so great, why have there only been 3,000 surgeries performed to date? If this technology is groundbreaking, shouldn't more people be using it? TransEnterix has focused its efforts towards developing the SurgiBot rather than marketing and selling the SPIDER System, which explains the low number of surgeries completed with the SPIDER System. TransEnterix's business model underwent a course correction in 2012 after they realized the disposable device model was unsustainable. The company was utilizing a 100% disposable business model, which means that for every SPIDER System sold, one procedure is performed. The SPIDER System is completely disposable and costs approximately $1,000 per unit. TransEnterix would have had to build a massive (and expensive) sales force to increase the volumes of the device significantly and achieve profitability. With surgeon feedback on the SPIDER asking for additional capability that was consistent with the benefits of surgical robots, the company decided in 2012 to take the deep clinical and commercial expertise of SPIDER and design the SurgiBot, which offers a business model that records revenue from a one time system purchase, and recurring revenue from annual service contracts and disposable instruments, identical to Intuitive Surgical's business model. This proven business model will allow TransEnterix to build out its presence on a much larger scale once the SurgiBot is approved. What about the Single-Site da Vinci System? This system also utilizes a single incision about the size of a quarter. While the Single-Site da Vinci System does utilize a single incision about the size of a quarter, there are still a number of drawbacks when compared to the SurgiBot. Besides the high costs and large footprint, the da Vinci System's version of single port surgery requires the instruments to cross each other at the operating site. This cross-orientation presents a serious learning curve for surgeons, and limits the capability of surgeons and their overall performance. Many times the crossed instruments are so close together that they clash into one another during the procedure, known as the "chopsticks effect." Finally, the da Vinci System single-site does not have "wrists" like its multi-port system, which removes one of the key benefits of robotics. The SurgiBot offers true internal triangulation, which allows the surgeons right hand to control the right instrument and the left hand to control the left instrument. This, combined with the fact that the surgeon is patient side, with hands on the instruments (like the traditional laparoscopy with which they've become comfortable), reduces the learning curve associated with the system and is more comfortable for surgeons. The SurgiBot's low price point will be viewed as a cheaper alternative (gimmick) with less functionality when compared to the already proven da Vinci System. Would you want to plunk down say $500k for the newer, cheaper, unproven robot that no one knows how to use yet, or do you pay up and get a da Vinci that already has the brand recognition? The price point of a system should not be reflective of its functionality and reliability. After more than a decade of technological advancements, a less capital-intensive machine that offers more capability and reliability has been developed to fix the problems associated with the current technology in place. The SurgiBot is that machine. The smaller footprint and lack of multiple large robotic arms allows TransEnterix to sell its system at a sub $1 million price point and still make a tidy profit. The core technology behind the SurgiBot has already been proven with the more than 3,000 procedures performed with the SPIDER Surgical System, and its ease of use will attract more and more surgeons to the device. Intuitive Surgical's recent earnings release represents an overall trend of hospitals and surgeons shifting away from expensive multi-port surgical robots and towards less expensive single site robots. Intuitive Surical experienced a drop in revenues due to lower system sales, and lower operating margins due to increased pricing pressure. The company is continuing to experience an increase in sales of its da Vinci Single Site Systems on a sequential and yearly basis. Management's failure to offer 2014 guidance decreases visibility for investors and foreshadows the continued slow down in system sales for Intuitive Surgical. 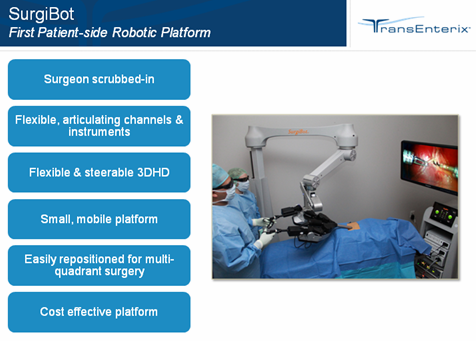 TransEnterix's SurgiBot will surely benefit from the increase in attention/sales for single port surgical robots. TransEnterix is a small cap medical device company that is subject to a number of risks, including sharp volatility, intense competition, and failure to receive approval for the SurgiBot in 2015. I believe the latter risk is extremely low given the fact that the FDA has already approved the core technology behind the SurgiBot back in 2009. TransEnterix has yet to turn a profit and the company has an accumulated deficit of nearly $100 million. TransEnterix has more than 200 million shares outstanding on a fully diluted basis, and it should be expected that the company holds a secondary offering by the end of 2014 to raise more money to support the commercialization of the SurgiBot. The company had nearly $24 million in cash as of September 30th, 2013, so a financing should be expected in 2014. Investors should keep in mind that there are multiple venture capitalists that have been invested in TransEnterix for more than five years, so any secondary offering will likely be shareholder friendly rather than destructive. The fact that TransEnterix already has an installed customer base of its core technology should lend credibility to this medical device company and quell any fears that the SurgiBot will experience a tough reception when it makes its market debut. Consider the fact that more than 3,000 procedures have been performed with the SPIDER System, with Dr. Sherman Yu completing more than 100 procedures. Let's assume that Dr. Yu is an outlier, and the average surgeon using the SPIDER System has performed 15 procedures to date. That's equivalent to a minimum current install base of 200 surgeons. Let's assume 90% of the current install base plans to purchase a SurgiBot, or 180 surgeons/hospitals. Assuming that the sale of one SurgiBot will generate an average of $650,000 in the first year (initial purchase $500k + annual contract $50k + annual replacement of instruments $100k), TransEnterix would generate approximately $117 million in revenue. Utilizing the industry average price/sales ratio, shares of TransEnterix would be valued at approximately $1.70 on a fully diluted basis. Utilizing Intuitive Surgical's price/sales ratio of 7.3, shares of TransEnterix would be valued at approximately $4.00 per share on a fully diluted basis, representing a 250% increase from the stock's current $1.57 price. Keep in mind this is a conservative estimate solely based on TransEnterix's current estimated SPIDER install base, and does not take into consideration any of the 10,000+ hospitals/private surgical centers located in America or the international opportunity. TransEnterix stands to be the first breed of competition Intutive Surgical will be facing in the relatively new surgical robot marketplace. The SurgiBot's long list of positive attributes will surely give the da Vinci System a run for its money, and even a small slice of market share for TransEnterix would equate to a higher valuation than today's ~$380 million market cap. The growth prospects for this company are massive, and investors should brace for a period of accelerated growth while the medical community begins to learn about, and adopt TransEnterix's revolutionary product. 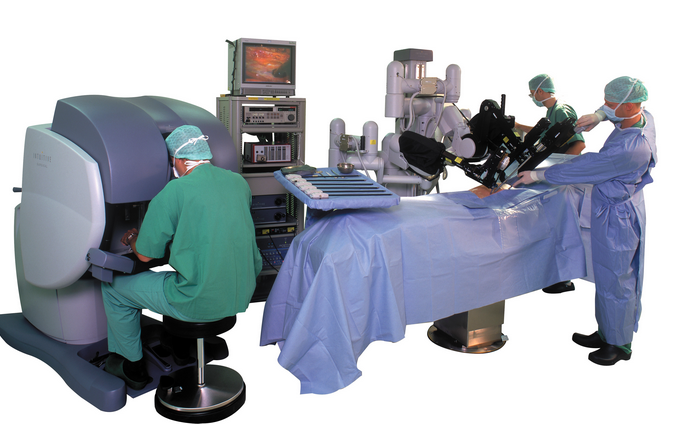 The robotic surgery market is expected to grow upwards of $20 billion by 2019, and the global market for minimally invasive surgical devices is expected to reach $35 billion by 2016. TransEnterix is well positioned in a high growth market and will be able to expand this market thanks to the SurgiBot's affordable price and small footprint. Shares of TransEnterix are an easy double if management continues to execute its strategy and introduce the SurgiBot to hospitals and surgeons around the world in 2015. Shares of the company have been trading range bound since the merger with SafeStitch Medical was announced, and they seem to be putting in a solid bottom after months of sideways consolidation. Any press releases regarding the SurgiBot's progress, or initiation of analyst coverage can act as a positive catalyst for the stock. At today's current price, I believe TransEnterix offers a compelling risk reward profile for the speculative investor who treats this as a long-term play. 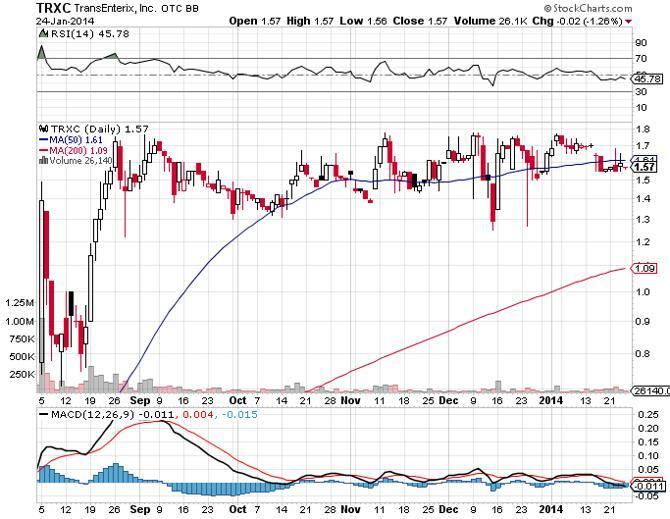 Additional information was sourced from this First Analysis analyst report, and TransEnterix's 3Q 2013 conference call. 3 comments to ''Why TransEnterix Is A Formidable Contender In The Surgical Robotic Market"
First to the market with a single port surgical robot. Wrong. SILS base been performed by the DaVinci Si since 2010 and it's not a popular technique.